Good morning Junkies! I hope everyone had a wonderful Labor Day weekend. 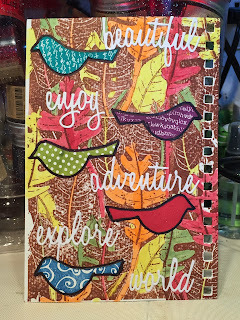 I have a bright journal page for your today using one of the new September releases. I stamped the new release Oak Leaves onto my page several times, carefully matching up the edges, using Gingerbread ink. I then painted some of the leaves with Art Anthology Velvet in Desire, Tango, Lemon Tart, and Shamrock. Next I stamped Birds, Set of Five in several different colors of ink and cut out. I arranged them on my page and after gluing them down (I used my Xyron sticker machine), I outlined then in black Sharpie to make them stand out. To finish the page, I added words from the Sizzix Thinlits Adventure die set. I sprayed Art Anthology Wild Orchid and Salted Caramel Colorations onto my page. Next I stamped Big Winged Butterfly on a piece of mixed media paper and cut out. I painted the butterfly with Art Anthology Sorbets in Pixie, Coral, and Mi Bella. Before gluing it down, I added dots using the Art Anthology Dottie stencil and Azure Sky Blue ink. 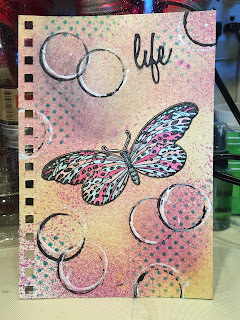 Once my butterfly was in place, I then added circles using the top of one of my Art Anthology paint bottles, Tuxedo Velvet, and white paint. The word "life" comes from the same Sizzix Thinlits Adventure set I used above.